Love coffee, love chocolate? Here's a delicious Mocha Iced Coffee to satisfy all who love both. Great on a hot summer day. Enjoy! Place ice cubes in blender. Pour chocolate syrup over the ice, then blend it together. Pour in the 1/2 cup milk, then blend. Put the 2 tsp. sugar in, then pour the 2 cups of brewed coffee in, blend well. 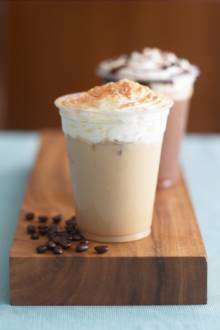 Pour iced mocha coffee into cup or glass and garnish with whipped cream and a little ground cocoa, nutmeg or cinnamon, if desired. As I'm Brazilian, I cannot speak English, so I do an English course. On one of my activities I had to read a post of a food website, and write a little about it, so I chose the sweet mocha, and it's really nice, I imagine how delicious it is. This is great, as I always try a recipe and give a review so this recipe was DELICIOSO! Very good. I like it all day!